The City of Albany government has taken a number of steps to reduce its contribution to climate change. As part of the City's Comprehensive Planning process, Albany created a Climate Action Plan that identifies targets and initiatives to reduce greenhouse gas emissions from municipal operations and the community. This Climate Action Plan uses a baseline year of 2009 for the City's greenhouse gas emissions. The Climate Action Plan was adopted by the Albany Common Council along with the rest of Albany 2030, the City's Comprehensive Plan, in early 2012. While mitigating risks is an important reason for Albany to respond to climate change, doing so also has many co-benefits. Implementing actions that save energy and reducing greenhouse gas emissions also cut costs, create jobs, and improve quality of life for residents. The actions Albany can take to reduce climate change will help us reach the goals in Albany’s comprehensive plan, Albany2030, to create a vibrant, livable, and sustainable city. The links below provide details on our current goals and completed projects. Excluding the landfill, buildings and streetlights produce the greatest share of the city government’s greenhouse gas emissions and consume the majority of the City’s spending on energy. In 2009 the City spent $5.4 million or 73% of the government’s energy budget on buildings and streetlights, a large portion of which went to National Grid for the operation and maintenance of streetlights. The measures we are undertaking will not only reduce energy use and energy costs, but also help improve worker productivity and employee engagement in sustainability. Target: Reduce greenhouse gas emissions from the city’s buildings and facilities 10% by 2030. The City of Albany is participating in an exciting new project with the New York Power Authority (NYPA). Albany is one of 5 cities in the state (along with Buffalo, Rochester, Syracuse, and Yonkers) to partner with NYPA in the development of a comprehensive municipal energy plan. Albany's Energy Plan was released in early 2015 and can be found here. The City of Albany is continuing to work with NYPA on the implementation of this important plan. The City of Albany developed an Energy Conservation Policy to help employees conserve energy and reduce waste in city operations. The policy includes measures to turn off lights when not in use, reduce heating and cooling in buildings, enable power save mode for computers and electronics, and purchase energy efficient equipment. Each department appointed sustainability ambassadors to help monitor and enforce the implementation of this program. Retrofitting buildings and upgrading equipment have high initial costs but generate huge savings over the long term. Proposed retrofits in City Buildings include changing lights, upgrading boilers and HVAC systems, changing windows, tightening building envelopes and other actions to improve energy efficiency. The City currently spends 57% of its overall energy budget on streetlights and traffic signals, the majority of which goes to National Grid for maintenance and operation of the streetlights. The City is actively investigating opportunities for transitioning to more energy efficient LED lighting. The City is actively pursuing options to generate electricity from renewable sources for City uses. The City will apply for grants and develop a plan for implementing feasible options. In 2011, the City of Albany Department of General Services (DGS) completed lighting upgrades in 23 City buildings. National Grid provided 70% of the cost of these upgrades. Upgrades included switching lights to CFLs and LEDS and installing motion sensors. Savings are estimated to be around $55,000 a year. Transportation accounts for 21% of the community’s greenhouse emissions and impacts air quality and the quality of life for residents. The city owns and operates approximately 600 cars, vans, trucks, and heavy duty vehicles. In 2009, the municipal fleet emitted 6640 metric tons of CO2e, or the equivalent of greenhouse gas emissions from 1,302 passenger vehicles in a year. Albany’s 2030 plan contains many elements to improve multimodal transportation in the community such as improving pedestrian facilities and public transit and implementing the Bicycle Master Plan. Target: Reduce vehicle miles travelled (VMT) by 20% by 2030. Currently, City of Albany employees commute in single occupancy vehicles more than 80% of the time. To reduce greenhouse gas emissions from employee commutes, we are looking to implement initiatives that encourage City employees to use alternative modes of transportation such as carpooling, riding public transportation, walking, biking, and telecommuting. We will continue to add hybrid vehicles to the municipal fleet as well as investigate alternative fuels such as compressed natural gas and biodiesel. We are also investigating a car share program to reduce the number of vehicles owned and maximizing each vehicle’s usage. As the City of Albany has grown and expanded, street use and mobility within our community has changed. In June 2013, the Albany Common Council adopted a Complete Streets Ordinance, which aims to create roadways that accommodate the many demands for access, safety, and use by people of all ages and abilities. Albany was recently awarded a Community and Transportation Linkage Planning Program grant by the Capital District Transportation Committee in order to create a Complete Streets Policy and Design Manual. The manual will determine street typologies, provide design guidance, and establish policies with standards of implementation. The Department of General Services, the Division of Traffic Engineering, and the Division of Planning have been given the responsibility of developing this manual. The creation of this document also takes into consideration feedback from stakeholders. It will be used as a guide by municipal departments when instituting any City street construction, reconstruction, or resurfacing projects, as well as for public and private developments. The City of Albany is currently undergoing the implementation of enhancements to the Corning Riverfront that will improve its accessibility. Through this initiative, the City aims to increase the opportunities for pedestrians and cyclists who spend time at the Preserve. These enhancements are part of the Corning Riverfront Master Plan, which seeks to enhance its aesthetics, improve accessibility, and provide more recreational possibilities for visitors. This Master Plan is a direct result of public outreach to community stakeholders and is available on the City’s 2030 Plan website at www.albany2030.org. The City of Albany is currently in design phase of the Madison Avenue Traffic Calming project, also known as the Madison Avenue Road Diet. This project will calm traffic along Madison Avenue and better accommodate more users by improving pedestrian and bicycle access and incorporating Intelligent Transportation Systems (ITS) for local traffic signals. A typical road diet involves the reallocation of four travel lanes to three travel lanes (one travel lane in each direction with a center two‐way left‐turn lane) to improve mobility for all users. ITS for local traffic signals improves efficiency of the roadway with synchronized signals that respond to traffic flows and peak demands. These coordinated traffic signals and road diet will assist drivers, bicyclists, and pedestrians in reaching their desired destinations safely. The final design for this project is expected to be released soon, followed by phase I of construction. The City of Albany received a grant under the Clean Water State Revolving Fund (CWSRF) to construct portions of a Complete Street that includes Green Infrastructure (GI) design improvements along Quail Street. The segment of Quail Street included in the grant falls in the Albany Education District between Madison and Central Avenue. The project includes new trees to expand the urban canopy and reduce runoff, pervious pavers and bio-retention areas to increase infiltration and improve water quality. The College of Saint Rose and the University at Albany’s Downtown Campus are partners with the City on this project. Through funding from NYSERDA and NYSDOT, the City of Albany was able to conduct a feasibility study on installing electric vehicle charging stations in the city. Through this initiative, the City assessed current opportunities to incorporate electric vehicles into the municipal fleet and identified zoning and policy changes that need to be revised to better accommodate electric vehicle infrastructure. In 2009, Department of General Services received an award to purchase 12 hybrid vehicles. 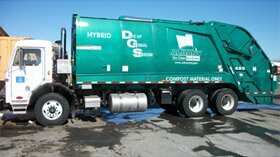 DGS has already purchased 7 hybrid vehicles, including a hybrid waste hauler and a hybrid hydraulic vehicle. The City will incorporate more hybrids into the municipal fleet. In addition, DGS instituted a no idling policy for its drivers. The City of Albany received a GreenLITES (Green Leadership In Transportation Environmental Sustainability) award from the New York State Department of Transportation for the reconstruction of Delaware Avenue (NYS Route 443) from the New York State Thruway Bridge to Madison Avenue. As part of the project, the city recycled and reused granite curbs, coordinated traffic signals, brought pedestrian facilities into full ADA compliance, and installed LED pedestrian streetlights. The City of Albany, in partnership with the Capital District Transportation Committee (CDTC), created a Bicycle Master Plan to identify a network of bicycle routes to improve cycling as a viable mode of transportation throughout the City. The network will support a safe and healthy transportation alternative and enhance the quality of life in the City. The City of Albany purchased and placed 93 solar powered trash compactors and 20 compacting recycling containers in streets throughout the city. The Big Bellies compact trash so that it does not need to be emptied as often which saves on vehicle fuel and labor hours, as well as helping to increase recycling in public spaces. Unlike most other communities in the Capital District Region, the City of Albany owns and operates a landfill that is used by many communities in the region. Landfills typically are a significant source of greenhouse gas emissions due to the methane generated from decomposing waste. 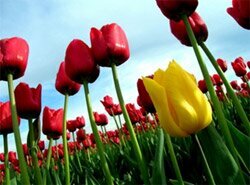 Methane is twenty times more powerful as a greenhouse gas than carbon dioxide. Most of it is captured and destroyed in the landfill’s comprehensive gas collection system, although, as is typical for landfills, some of it escapes and is responsible for net emissions. Reducing emissions at the landfill is particularly challenging because the landfill receives waste from several municipalities in the region and the City of Albany receives significant income from commercial haulers that dispose of their waste at the landfill. Target: Increase the amount of waste diverted from the landfill from 42% to 65% by 2030. Target: Reduce CO2 emissions from wastewater and and water treatment by 10% by 2030. The Municipal Waste Reduction Program focuses on increasing recycling, reuse, and waste reduction in municipal operations. The Department of General Services coordinates with other City departments to make sure that recycling bins are present in the various offices and that employees are given proper instructions for recycling. Each City department also has an appointed Sustainability Ambassador responsible for monitoring and encouraging waste reduction and energy conservation among employees. The City currently captures a significant amount of the methane emitted at the landfill- 80%. A portion of that is burned to produce energy used at the landfill (18,600 Megawatt hours in 2009), while the rest is flared and released into the atmosphere. While its current methane capture rate is above national averages and it will be difficult to do so, the City is investigating options to capture even more methane. Any increase in the capture rate will have a dramatic increase in the City’s overall greenhouse gas emissions. The City of Albany adopted a Single Stream recycling program in August 2011 in an effort to boost recycling rates throughout the city. Bins are available free of charge to Albany residents through DGS. Albany’s recycling program accepts plastics #1-7, cardboard, paper, cans, and a wide range of other items. Albany also introduced recycling into all the schools located within the city. Schools that implement their recycling program have recycling picked up by the City. The Department of General Services regularly offers events for hazardous and electronic waste collection. The Department of General Services picks up yard waste from city residents and contractors and puts it through a lengthy composting process before it is given away to City residents, used throughout the city in gardens and grounds or sold to contractors as mulch or wood chips. In 2009 the compost facility produced 3,549 tons of finished products. The City of Albany is home to many beautiful and imperative natural spaces, a number of which are underutilized. One of these spaces is the Tivoli Lake Preserve, and 80-acre urban nature preserve located on the edges of the Arbor Hill and West Hill neighborhoods. Though the Tivoli Lake Preserve is rich in natural attractions, it is highly underutilized by the community and suffers from a lack of water managment and other issues subsidiary to the enclosure of Patroon Creek. the Tivoli Lake Preserve has the potential to become an actively used centerpiece of the surrounding community as well as a destination for people througout the City and beyond. In 2014, the City conducted a community engagement and visioning process that offered an opportunity for residents and other stakeholders to create a vision for how they would like to see this incredible resource used in the future. This opportunity was made possible through a grant from the New England Interstate Water Pollution Control Commission (NEIWPCC) and New York State Departmtne of Environmental Conservations's (NYSDEC) Hudson River Estuary Program, in partnership with the New York State Office of Environmental Justice. The final plan can be found here. The City of Albany is currently working with the NYSDEC on implementation of components of the Visioning Plan. The new and improved North Swan Street Park recently emerged on a one-acre plot in Arbor Hill that formerly comprised of a basketball court and asphalt area in a state of disrepair. North Swan Street park now provides a welcoming community space and park with several envrionmentally-friendly features developed through extensive outreach to and input from the community and designed to EPA Green Project Reserve standards. Green features within the North Swan Street Park include porous asphalt, permeable reinforced concrete pavers, porous concrete sidewalks, a rain garden, bio-retention facilities, soil restoration/de-compaction, vegetated swales, and tree plantings. The Water Department has installed a rain garden at the corner of Pinewood Avenue & Hackett Boulevard using a design created by members of the Helderberg Neighborhood Association with assistance from the Water Department. This rain garden was awarded to the Helderberg Neighborhood Association by the Affordable Housing Parnership and the Planning Department as a prize for winning the Neighborhood Energy Challenge. Commission and created a $1 million endowment. 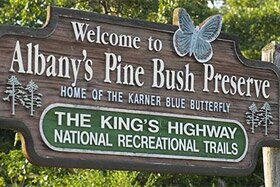 The City also contributed over $1.5 million dollars to the Pine Bush Preserve Commission through the imposition of a “tip fee surcharge” on all waste disposed at the landfill. Closures of previously filled sections of the landfill are being rehabilitated with native vegetation and restored to habitat. Reducing Pesticide Use - In 2009 the landfill stopped using rodenticides and started using non-chemical pest control items such as traps, sticky pads etc. to manage rodents and other pests. DGS also changed the pest control contract for city owned buildings to green pest control products or procedures. Using Green Cleaners - Department of General Services uses approximately 50% green cleaning products at city facilities. The black top crew is now using an environmentally friendly cleaner that is citrus based in place of diesel fuel to clean black top residue off of their tools and the paver. The graffiti crew uses green products to remove graffiti throughout the city. We are currently in the process of trying to find even more green products to increase our options when removing graffiti. Environmental Snow Removal - The City now applies road salt with magnesium chloride, a less corrosive product, for snow removal instead of calcium chloride. Environmental Building Products - Central Maintenance is using environmentally friendly supplies and materials such as adhesives, composite wood, stains and paints whenever available for projects in city buildings.